Palladium is similar in many respects to Platinum. It is an extremely resilient metal being resistant to heat and many other chemicals. It is also difficult to tarnish. It is considered to be a chemically stable metal. 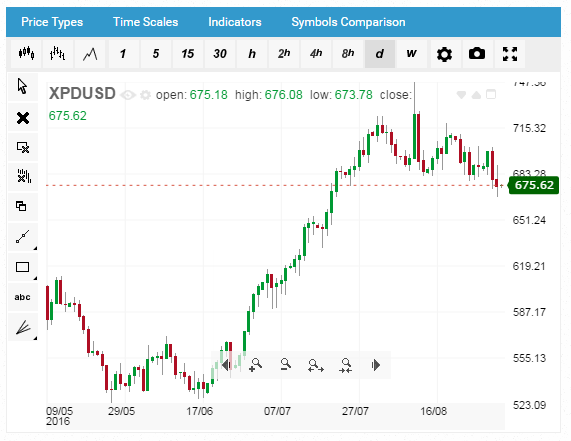 A key feature for traders is that despite it’s status as an internationally traded precious metal commodity, palladium does not experience the same volatility as gold or silver. This is despite the fact that one of every four goods manufactured today will contain at least one component made from either palladium or platinum. Therefore the market for palladium is large while the price per ounce is comparatively low. An enticing combination for those interested in commodities trading. Palladium has a variety of uses including jewelry, electronic applications such as computers, mobile phones and televisions and industrial uses such as its use in hydrogen isotope storage and in groundwater treatment. It is also used in the manufacture of fuel cells because of its ability to store hydrogen. Russia is the major producer of Palladium accounting for about 70% of the world’s supply. South Africa makes up for most of the remaining percentage mainly due to its production as a by-product nickel mining. The largest consumer of palladium is the automotive industry where it is used in the manufacture of a number of components. Trading hours: Palladium trading begins on Sunday 23:00 GMT and ends 22:00 GMT Friday night with a daily break between 22:00 to 23:00. Palladium is mostly traded worldwide between 01:00 – 17:30 GMT, Monday to Friday, and spreads are usually higher during out-of-business hours. For more information on palladium and other related trading products, go to our blog website, forex.info.